WITH so much anticipation, so much at stake, so many people watching and so little progress, emotions at the Copenhagen climate meeting are starting to run high. Ian Fry, the bow tie-wearing Queanbeyan resident who is chief negotiator for the tiny Pacific island state of Tuvalu, almost broke down as he explained to the conference the reason for the hardline stand Tuvalu had taken — a stand that had stalled negotiations for more than a day. Fry, on behalf of Tuvalu and other small island states for which sea-level rise is a survival issue, has been insisting that the conference consider a second binding protocol to run alongside the Kyoto Protocol, taking in the US and China — the world's two biggest greenhouse gas emitters — and other developing countries not required to make emission reductions under the 1997 Japanese agreement. Standing against the world on behalf of a country with a population of 12,000 clearly put Fry under enormous pressure. One of many arguing that Tuvalu should back down in the interests of getting on with the talks was Kevin Rudd, according to conference delegates. Explaining his stance, Fry said: "This is not an ego trip for me. I have refused to undertake media interviews. I am merely a humble and insignificant employee of the Environment Department of Tuvalu. "I woke this morning and I was crying, and that is not easy for a grown man to admit," he said, his voice wavering. "The fate of my country rests in your hands." Passions were also strong at a candlelight vigil outside the conference centre, marking the end of a march by 40,000 people from the city to the hopelessly misnamed Bella conference centre demanding that their politicians strike a "real deal" on reducing greenhouse emissions. South Africa's Archbishop Desmond Tutu told the vigil: "We want to remind you that they marched in Berlin and the wall fell. They marched in Cape Town and apartheid fell. They marched in Copenhagen and we are going to get a real deal." The shame is that the sheer intensity of the collective effort of the demonstrators seems inversely proportional to the actual progress being made. Conference organisers hope that the thought of the anger and dashed expectations that would follow a failure at the talks will weigh on the minds of leaders when they arrive later in the week. Asked whether the thought of disappointing so many played on negotiators' minds, Danish environment minister and conference president Connie Hedegaard said: "I am absolutely sure that leaders consider that very much, and personally I think it has taken years to build up the pressure we have seen around the world and I believe that has contributed to making the political price for not delivering in Copenhagen very high." And further angst in Warsaw four years later. 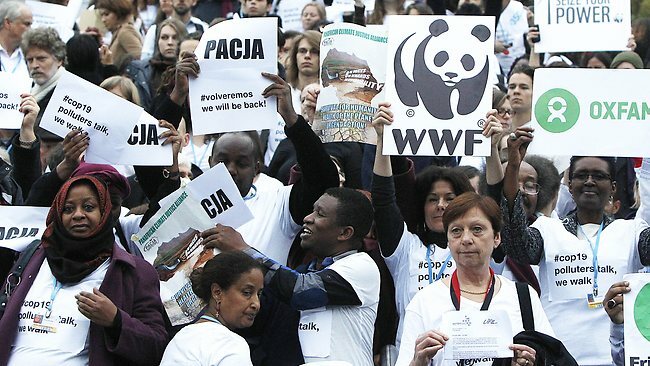 WARSAW: Exasperated green groups walked out of faltering UN climate talks in Warsaw yesterday as rich and poor nations bickered about who must do what to curb planet warming. The negotiations entered their penultimate day in a stalemate over how to curb dangerous greenhouse gas emissions and channel aid to poor, climate-vulnerable states. In a dramatic flourish, six environment and development groups walked out, saying the annual talks had delivered little more than hot air, and no action, since opening on November 11. Oxfam founded in Oxford in 1942 for famine relief in Greece. Chiefly volunteers. ActionAid founded in UK in 1972 as a child sponsorship charity for third world countries. Friends of the Earth founded in the US in 1969 as an anti-nuclear group by "Archdruid" David Brower following disagreements with the Sierra Club, a National Parks organization founded in 1893 of which David Brower became CEO and launched to higher prominence in 1952. FOE International currently has a small office in Amsterdam. "People around the globe have a right to know about the desperate state of these negotiations," said an Oxfam statement. "The stakes are too high to allow governments to make a mockery of these talks." The groups pointed the finger at Poland for its "endorsement" of a global coal summit held in the same city and at the same time as the talks; Japan for slashing its carbon emissions goal; and Australia's decision to scrap a carbon tax on high emitters. "Talks like these amount to nothing if countries refuse to … negotiate in good faith or, worse, try to drag the process backwards," said WWF's Samantha Smith. On Wednesday, UN Secretary-General Ban Ki-moon had urged nations to "much bolder" action to stave off an existential peril for the Earth. The talks, involving more than 190 nations, are meant to pave the way to a pact by the end of 2015 to limit warming to 2C higher than pre-industrial levels. At its heart would be national pledges to tame carbon gases emitted by burning coal, oil and gas, which provide the backbone of the world's energy supply today. On current emissions trends, scientists warn that the Earth could face warming of 4C or higher. Delegates said there had been few advances in crafting a roadmap for arriving at the historic climate deal in Paris, now only two years away. "There are still things that are very important to us where we do not see enough progress, for instance a clear timeline, and key elements of the 2015 agreement," European climate commissioner Connie Hedegaard said after late-night talks. "We are not moving forward in our discussions." Developing countries want wealthy nations to shoulder a bigger share of emissions cuts to make up for a long history of fossil-fuel combustion. The West, though, insists emerging economies must do their fair share. Another quarrel is over money. Developing nations are challenging wealthy countries to honour a 2009 pledge to muster up to $100 billion by 2020, up from $10bn a year from 2010 to last year. Still struggling with the effects of the economic crisis, however, the developed world is wary of unveiling a detailed plan at this stage, or pledging any new short-term figures.